New Delta homes for sale with unfinished basement suites are now here! Located within the master planned Morningstar Homes Sunstone Delta real estate community, the South Pointe homes is the latest phase in this single family home development by one of the most trusted and boutique builders in the Lower Mainland. New to the Delta real estate market, these South Pointe at Sunstone single family homes will feature something special: full unfinished basements! The city bylaws previously prevented builders and homeowners from building basements into their property, but with the recent changes after the launch of the Morningstar Homes Terella and North Pointe Sunstone home communities, the South Pointe at Sunstone Delta homes for sale will present something different, innovative and truly flexible for home purchasers! This exciting new addition will increase the value of your home instantly, and create more flexible living spaces for you and your family that will dramatically change your lifestyle. The new Delta South Pointe at Sunstone Morningstar Homes development has collaborated with Delta City bylaws in order to add an expansive eight foot ceiling basement. The extra space undoubetly creates more living space for families, and can be used as a media room, fitness gym, crafts room or anything really. The Morningstar Homes development team listened to the homebuyers of Terella and North Pointe at Sunstone, and decided to push the Corporation of Delta bylaws to include the addition of unfinished basements in this newest phase in the master planned Sunstone Delta real estate community, which is a great and huge selling point for homebuyers. Sustainable and affordable homes is what purchasers are looking for, and with the addition of full unfinished basements here at the new Delta South Pointe Homes at Sunstone, they have every reason to purchase now. There has been great interest in these new houses and 12 new South Pointe at Sunstone Delta homes have already sold. There are only eighty eight new Sunstone South Pointe Delta homes for sale in total and these executive houses will range from three to four bedroom layouts. They are also absolutely huge, with the smallest floorplans being three thousand three hundred and twenty three square feet to the larger layouts at South Pointe Delta homes for sale at approximately thirty five hundred and ninety eight square feet in size. There are a total of 5 floorplans for homebuyers to choose from. Affordability is a key to the success of the Morningstar Homes South Pointe at Sunstone Delta home community, with presale pricing starting in the six hundred thousand dollar range, which is great value. Not only are you purchasing a new Delta home for sale, but the Morningstar Homes South Pointe houses use green technology that will lower your carrying costs on the property (both energy and water efficiency). The South Pointe Delta Home presentation centre is located at 10527 Modesto Place and is open noon to six. North Delta South Pointe Homes with Basements! With the collaboration with the Corporation of Delta, the new South Pointe Sunstone Homes will have full unfinished basements, something that both the previous house releases at North Pointe and Terella didn’t have. This is the third neighbourhood released by Morningstar Homes, the most trusted and respected builder in the North Delta real estate market (and Lower Mainland). With the quality and craftsmanship seen in Terella and North Pointe releases, the presale Delta South Pointe Homes for sale will feature the highest end finishes and modern features that homebuyers are looking for today. Located in the master planned Sunstone Morningstar Homes development community, owners at the new Delta South Pointe homes will be close to great secondary and primary schools, in addition to tonnes of recreational and entertainment options. Shopping, groceries, banks and services are also close by, as are golf courses, areanas and community centres and parks. In addition, the Sunstone Village Market makes life even more convenient for homeowners at the new South Pointe Sunstone Delta home community. Located in North Delta real estate market, the South Pointe at Sunstone homes for sale are three and four bedroom residences with basements. Located at 10527 Modesto Place, North Delta South Pointe homes for sale are very easy to get to. From 84th Ave, just turn east onto Delsom Crescent and head through the round about past the Sunstone Clubhouse. Follow the Ring Road to the right heading west pas the pond and at the bottom of the hill, turn right into South Pointe at Sunstone at the signage. The sales manager for South Pointe Delta homes is Rettie and you can contact hime at 604.575.3304 for more information about this third Sunstone neighbourhood by Morningstar Homes. As we mentioned above, there are five home plans for homebuyers to choose from in this new community. Each of the five Delta South Pointe home plans also features two or three architectural exterior styles that you can choose that include West Coast Craftsman, Georgian or Tudor. This flexibility and the fact that you have full unfinished basements makes this third release by Morningstar Homes a definite step above Terella and North Pointe houses. The Shoreline home plan at South Pointe Sunstone Delta homes for sale is three bedrooms and 2.5 baths over 2155 square feet plus an unfinished basement of 1154 square feet. The main floor (1160 sf) features a great room, attached double garage, dining area, kitchen, powder room and den with a porch out front while the second floor (995 sf) features all three bedrooms in addition to the master ensuite bathroom (with separate tub from shower and dual vanities), walk in closet and laundry closet. 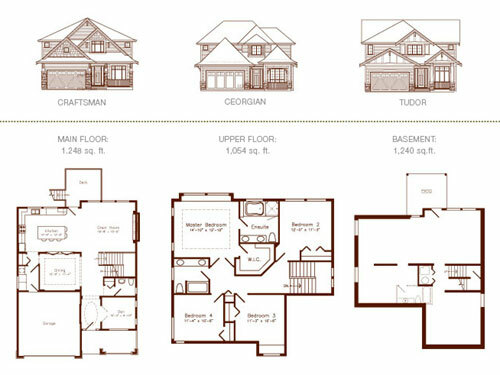 The pre-sale Delta South Pointe homes Shoreline plan comes in only Tudor and Georgian exterior facades. The Sandstone comes in all 3 architectural exteriors and features four bedrooms and 2.5 baths over 2302 finished square footage and an unfinished basement of 1240 sqft. Representing a very large North Delta home, the South Pointe Sunstone Sandstone layout features a main floor area of 1248 square feet and an upper floor of 1054 square feet. The Lighthouse South Pointe Delta house plan features 1282 basement (unfinished) with a main at 1288 and upper at 1017sf (2305 sq of finished area) with four bedrooms too. The Driftwood and Beachview plans are the two remaining South Pointe at Sunstone Delta home plans available in this third phase release. All floor plans are available for download online at the Morningstar Homes website. The North Delta Homes for Families are Now Selling! This exclusive 88 home community is conveniently locaed walking distance to Sands Secondary School and Gray Elementary School. Priced from the high $600,000s, South Pointe at Sunstone North Delta homes for sale feature 3 and 4 bedroom single family houses that will introduce basements (the first of its kind in the city and this community). Morningstar’s GreenStar building program ensures that these Sunstone South Pointe Delta homes for sale offer superior energy efficiency and indoor air quality with minimized maintenance requirements. Sunny, spacious home plans range from 3323 to 3598 square feet in great layouts. The presentation centre for the South Pointe Delta Homes at Sunstone is now open daily except Fridays.